The Skills Chart System is dependent on departmental procedures. These capture standard working practices so all employees understand the correct, most efficient way of working. If your company has a set of procedures in place, use these in conjunction with the skills chart. Increased productivity through skills chart procedure standardisation and understanding. Increased quality, together with a reduction in waste, production costs and lead-times. Increased profitability due to the above reasons. A higher skilled, more flexible workforce. Greater staff retention as employees recognise and appreciate the investment in their futures. Quality control documents for businesses considering ISO quality accreditation. The following steps have been developed as a quick and simple guide to assist you to produce procedures using the templates provided later in this section. In order to assist you with this it is necessary to record the flow of work through the department. This is called a process map, as it lists (or maps) all the individual steps of the overall flow of work (or process). To start, first you need to understand the flow of work through the department. What enters the department in terms of information and materials? Where does it come from? What leaves the department (information and materials) and where does it go next? You now have the beginning and end of the process. Following this, you must understand the individual steps or tasks that make up the process as it flows through the department. Think about these carefully. Just list the important tasks at this stage. Jot down your thoughts, listing the process in sequential order. To clarify this, draw a flow diagram (typically referred to as a process map). It only needs to be a rough sketch at this stage. You can access the Departmental Process Map by sending an email entitled 'departmental process map' to info@advice-manufacturing.com and we'll send you your own copy, free. Simply fill it in as instructed above. Break the complete process down into easily identifiable tasks. Use more tasks than those provided, if necessary; although do not break the process down into too many steps at this stage, as the procedures you are about to develop relate to each task. Writing procedures is the next step. Procedures are step-by-step instructions explaining how to undertake a particular task. The best method of obtaining accurate instructions is to ask the individuals who actually do the job most frequently. In order to understand everything they say, take notes about the task at their actual work location. This may be in front of equipment/machinery, at a bench, or at a desk etc. Before drafting skills chart procedures, always agree a time with the individuals concerned so they are not disturbed from their work and have ample time to thoroughly explain what the task entails. Take a pen and pad (or lap top), together with mobile phone capable of taking pictures or a digital camera, and go over to see the individual who undertakes Task No.1 at their work location. Remind them what you will be doing and why you will be doing it (use the procedure advantages listed earlier if necessary). Ask them to explain each stage of the task in sequential order. Carefully take notes about each stage. Ask questions about anything you do not understand. Importantly, ask why they do what they do at each step and make sure you understand the purpose. Use your mobile phone or camera to take pictures of items of interest, which illustrate the answers to your questions. Continue doing this until you have a detailed sequential description of all the steps involved in undertaking Task No.1. In short, you now possess a set of instructions (a procedure) to complete that particular job. Additionally, you also possess images highlighting key features of the process. Name this Procedure 01 (Code No PRO-0001). You’ll probably also want to give it a descriptive title. Undertake exactly the same process for each of the individual tasks that make up the process. 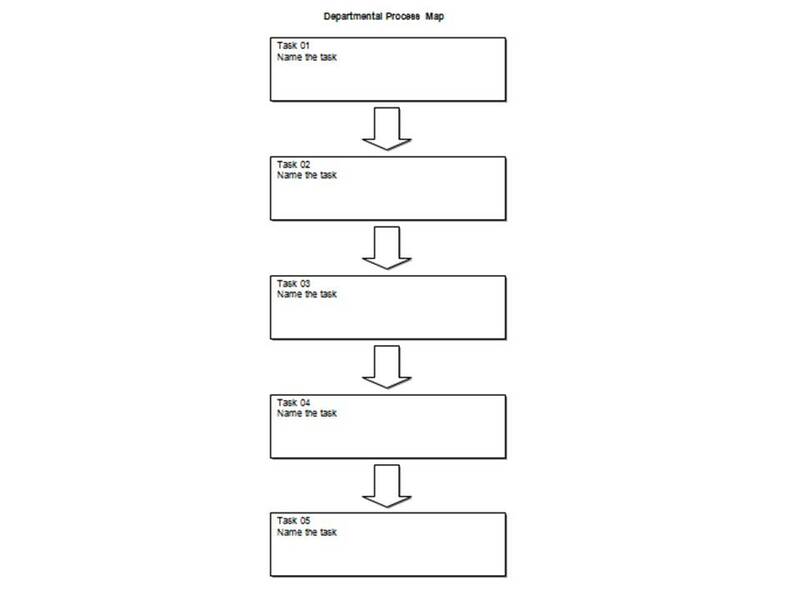 At the end of the exercise you will possess a complete set of instructions (or procedures), together with images describing how to undertake the entire departmental process, task-by-task. All you need to do now is present the information as official procedure documents. Fortunately we have supplied templates for this you can quickly and easily customise. You can access the Skills Chart Procedure Templates by sending an email entitled 'Procedure Templates' to info@advice-manufacturing.com and we'll send you your own copy, free. However before moving on, here are some important points and advice about the procedure templates and managing procedures in general. The procedure must be given a code number to be used on the skills chart. 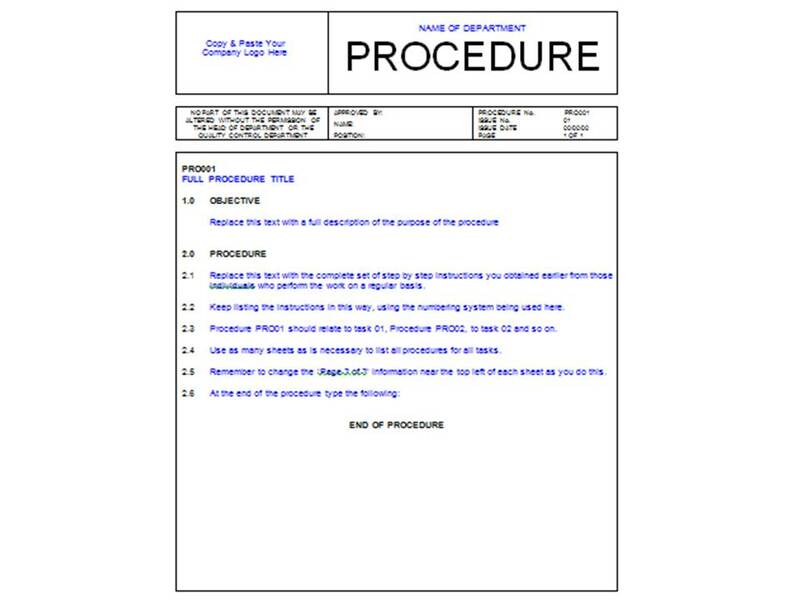 The procedure template currently features text which requests you to replace it with information relevant to your company. Follow the numbering system used on the procedure. Each procedure features an objective (the procedure purpose) followed by the procedure (the instruction notes you have made, above). Simply copy and paste the procedure template to produce as many sheets as you require. Consider displaying skills chart procedures on work area walls next to the skills chart. You can either stick laminated sheets to the wall or obtain plastic wall mounted sleeves from your stationary supplier. 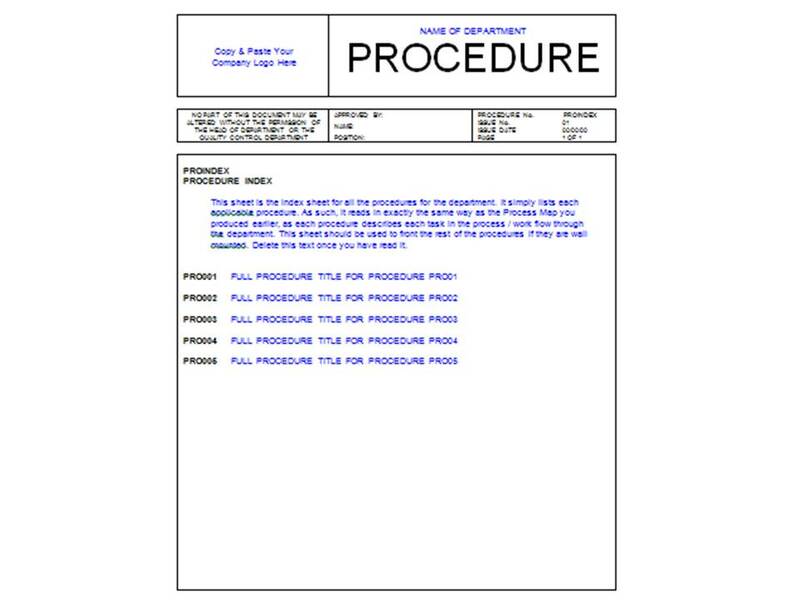 All procedure paperwork should be kept and controlled by somebody in authority such as the team leader or manager responsible for quality. They are also responsible for revising and updating procedures. Store procedures in a secure location on your IT network. Whilst it is useful many staff can access procedures, ensure there is control over any modifications or updates. Version control all documentation. The actual typing of procedures may be undertaken by administrative staff, as long as it is checking and approval is carried out by a senior technical person, as mentioned above. Insist on a signature and date on documents to ensure this takes place. The procedure system is modular in its design. As such, it can be developed for all departments across the business and rolled out as a company-wide set of procedures. The same principles apply as those covered earlier. It follows that skills charts can also be developed for all employees across the business. 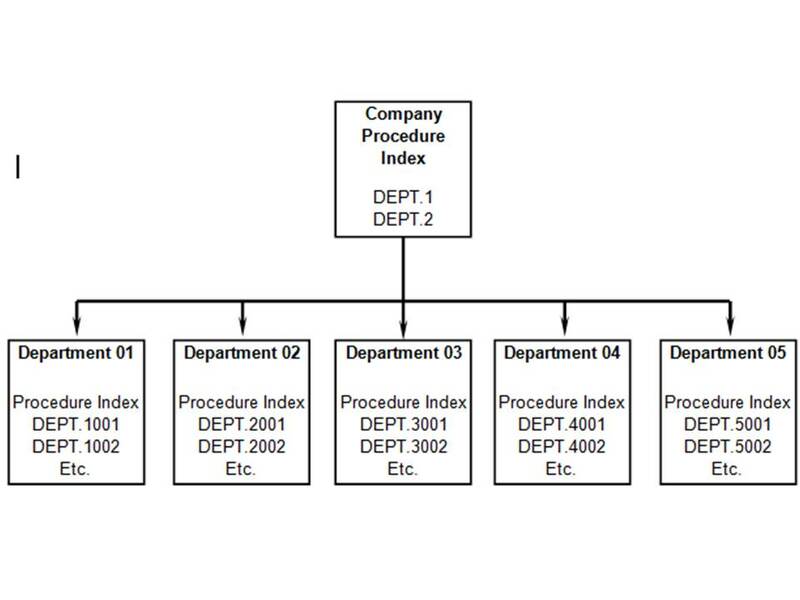 The following diagram demonstrates how all procedures can be linked into a set of comprehensive instructions for all company processes. In this way the skills chart and procedure advantages can benefit the entire firm.